This giant hellbeast of a truck is basically the same as the 2020 Chevy Silverado HD that launched late last year, but it doesn’t have that godawful face. You know what I mean. Meet the new GMC Sierra HD, which on looks alone is the big General Motors truck you want. 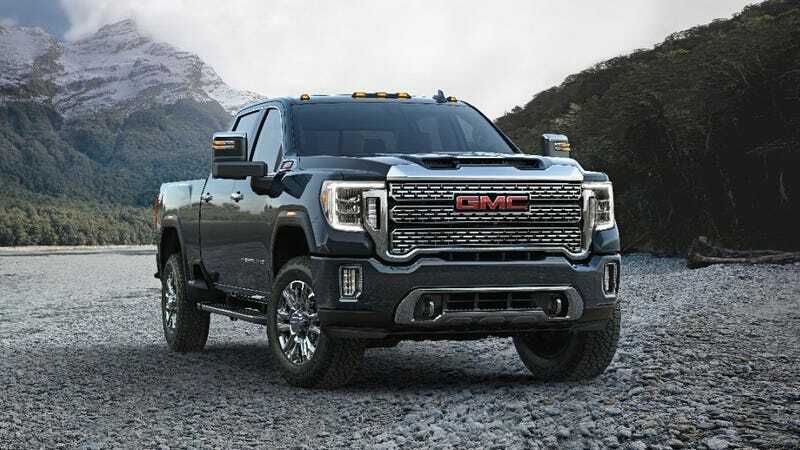 It comes with the same massive 6.6-liter Duramax Diesel V8 with 910 lb-ft of torque shoved through an Allison 10-speed automatic. This is a truck built for numbers, and while it hasn’t been certified yet, the towing capacity of this new whale should be north of 30,000 pounds. The GMC version of the HD adds 15 surround view cameras to make sure you can hitch up without a problem. It also adds cargo bed side steps in front of the wheel openings, and a convoluted multi-stage tailgate as standard. Three different packages are available with varying degrees of luxury. The Standard Sierra HD, and the high-lux Sierra HD Denali are basically what you expect, but AT4 HD package is new. When you opt for the AT4, you get a locking rear diff, off-road ready suspension package, Rancho shocks, factory skid plates, all-terrain Michelins, and hill descent control. Visually, it’ll have dark chrome instead of that bright stuff. The new Sierra HD will go on sale late this summer in 2500HD and 3500HD guise with either single or dual rear wheel options. Pricing and tow capacity of the Flint, Michigan-assembled trucks will be announced as production nears.